Travel or focus on your career at 25? Ouch. #CurrentLifeDilemma. As much as I'd love to answer travel, that is where my heart goes. And over the last month or so, my head has won- and as such, I'd say career. Nick and I just announced his retirement, round two, from hockey, in order to focus on career. We had a great couple of years in Sweden and traveling throughout Europe - and the world - but at this point in our lives, it was time to focus on long-term careers and to be closer to our family. So, career, you win for now. Especially as we are still able to travel a fair amount- we are living in a brand new city (and state) and already have a trip booked to Napa Valley and LA for me. tuk-tuk rides while in Thailand! Have a $10,000 budget for a holiday and fly first class for $5,000 and stay in mediocre accommodation OR fly economy for $1,000 and stay in luxury accommodation? Well, this one is pretty easy. Nick and I flew economy to Thailand - 12 hours from Minneapolis to Tokyo, 8 hours Tokyo to Bangkok, and then another 1.5 Bangkok to Koh Samui. In part because of flying economy, we were able to spend an entire month in Thailand for our honeymoon- as such, economy is definitely the way to go! We have been fortunate for the last two years that during the off-season, time is not our travel constraint- as such, we would much rather skimp on some things (like flying economy) and have much more time to spend in our destinations! private plane trip while in Dominican Republic... can't give up the amazing views from the air! Another easy one...I'm liking the start to this! Definitely never taking a train. I've enjoyed train rides in the past- but, you are limited in your destinations. On the other hand, you can fly pretty much anywhere in the world- so I'll keep on flying! Stay in a palm hut along the seashore for 7 days OR stay in a log cabin in the woods for the next month? Palm hut for sure. Unless if the log cabin was more luxurious than what I'm thinking- but right now I'm picturing spiders everywhere, of which I'm not a fan. Give me the beach all day, every day! Wake up without your wallet OR wake up without your passport and phone? Hmm... I'd say wake up without my passport and phone. First off, I'm stuck in about 2011 people- still rocking an iPhone 4s! Yep, I'm that person. Passports can always be replaced, and I'd love to replace my phone. Still having my wallet, with all of my IDs, credit & debit cards, would make life a little bit easier! I'd much rather be left behind during an African safari for sure. 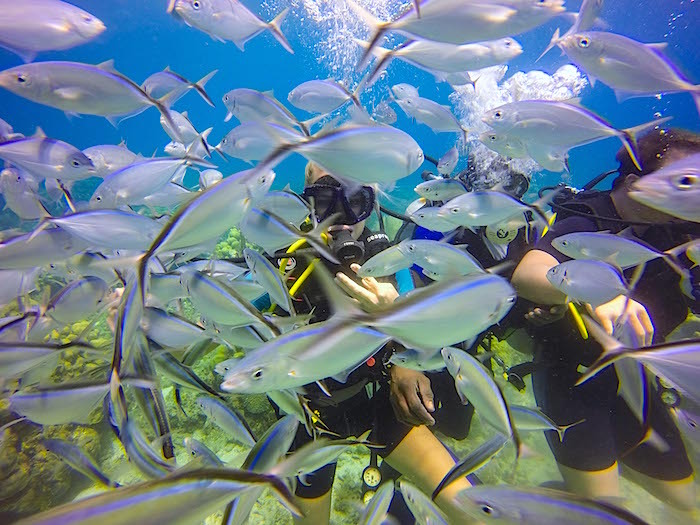 While I've loved scuba diving, it is a different experience for sure and I would not want to be stuck bobbing in the ocean all day! Lose your luggage and land on time OR land 12 hours late but with your luggage intact? Lose my luggage for sure. I've had this happen a fair amount of times (truthfully, way too many to be normal), when I've been forced to check a bag. I usually fly with just a carry-on bag so I'm good to go! I hate plane delays more than anything, so going without luggage is easier to replace than 12 lost hours. This is a tough one, especially for right now. Both Nick and I have landed pretty awesome jobs in Des Moines, but ... I'll let you read into that what you will. I think I'd have to answer a mediocre job in an awesome city- life is not all about work. I love the Swedish standard of 6 weeks paid vacation per year, plus a paid holiday at least every month (or so it feels, I swear!) I'd much rather have a mediocre job that I don't love and be living somewhere awesome! 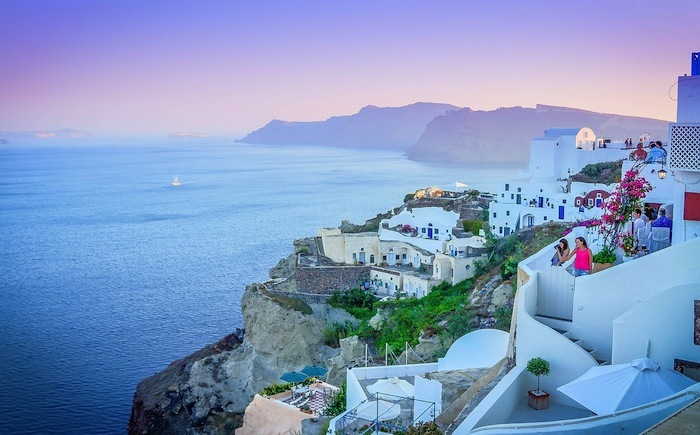 Greece is near the top of my list! Be able to teleport to places you've already been OR only be able to teleport to places you've never been before? Definitely only teleport to places I've never been. There are so many terrific places in the world that I have yet to explore, that it would be awesome if I could just magically appear there! Be stuck on a seven-hour delay OR show up at the airport and find out your flight is tomorrow? Hmm...I suppose show up at the airport and find out your flight is tomorrow. Again, I hate delays. If I am honest, I'm usually much too organized to not have the date of my flight right- but I can't imagine life would be too difficult if I showed up a day early. Just means that I would have a full 24 hours to double and triple check everything all over! Hands down, every language. I don't think this is even a question. I picked up a fair amount of Swedish over the last two years, and of course it helps that Nick is fluent. I've got to admit though, I am insanely jealous of his fluent Swedish, German, and passable Russian. Don't get me started on the Europeans who easily speak 3+ languages fluently- which is pretty standard. People don't realize how important languages are, or how valuable of a tool it is to know several. Side note- one of my favorite things about knowing Swedish while in the U.S. is that it is Nick and I's secret language, and whenever we don't want people to know what we are saying we switch right over to Swedish. It is our secret language! Travel back in time to meet your ancestors OR travel in the future to meet your descendants? Hmm....I've gotta go with ancestors. I enjoy history, and Nick loves it- so all of our travels have a bit of history wrapped into them. 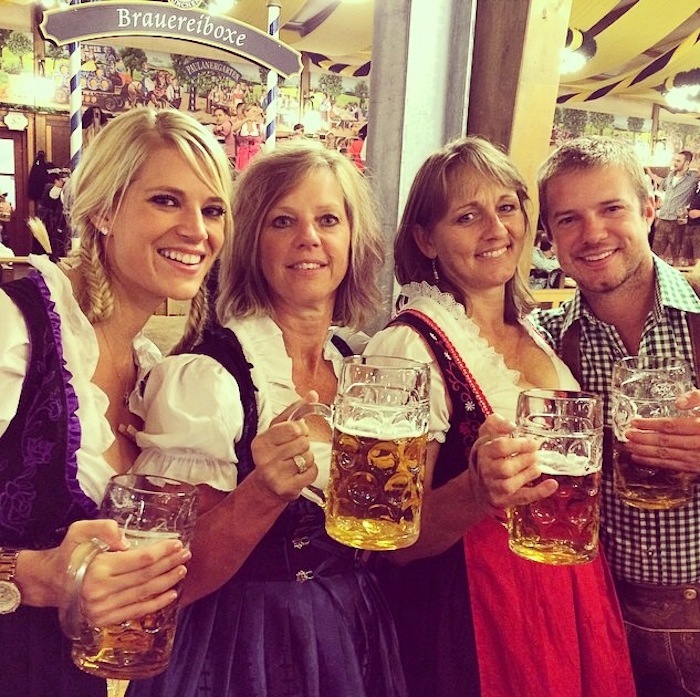 My family is pretty cool (see above photo, visiting Oktoberfest), so I can't even imagine how awesome my ancestors would be! My ancestry is mostly German and Norwegian, so they come from pretty cool places too. Have in-flight WiFi but no legroom (0 inches) OR in-flight legroom but no WiFi? Legroom, legroom, legroom. I've had flights with WiFi before, and while it is a nice perk- it absolutely isn't necessary for me. Flights are usually an awesome time for me to sleep, so what good does WiFi do if I don't even use it? Be able to eat anything and any quantity of food with zero negative health effects OR be refreshed and well rested after only three hours of sleep? Three hours of sleep, hands down. I swear, my body only functions normally when I get 9+ hours of sleep. I'm currently battling with this right now, as I just started my new (full-time, grown-up!) job this week. Waking up at 630 A.M. to get a run in before working 9-6, then trying to work on my MBA and blogging, only to fall into bed dead tired around 10 or 11...my sleep is lacking. And I miss it. This decision was also made pretty easy by the fact that I can stomach anything I really want to eat- so there is that! This is a tough one, because I don't know if I have a strong desire to do either. I suppose I'll say outer space, because why not? 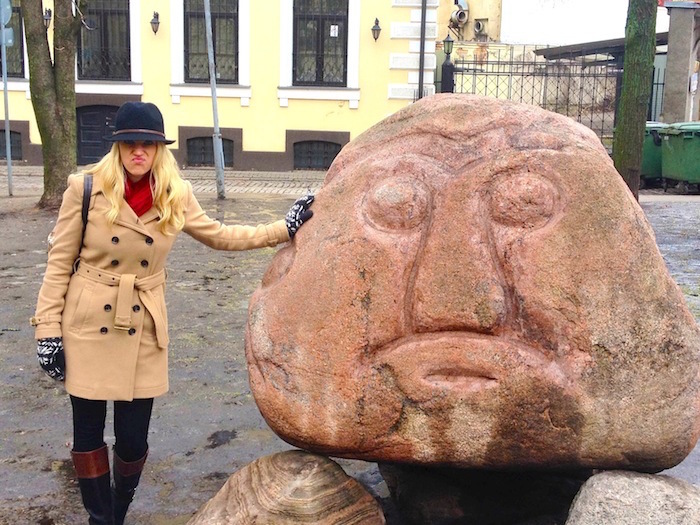 making faces while in Riga, because why not? Die happy in 5 years or die unhappy in 65 years? I'd rather not think about it, but happiness is so important. I don't understand why anyone would want to do something, continuously, on repeat, if they weren't happy. Obviously I understand that not every aspect of our lives is going to be perfect- but you have to have an end goal of being happy. If you aren't working towards that, whats the point? So there you have it with my travel edition of would you rather! And with that, I'm off to enjoy the gorgeous weather down here in Des Moines. Hope you all have a great weekend! What are your answers for some of these questions, and is there anything special affecting your current travel decisions? My Swedish definitely isn't perfect- far from it! But it works well for speaking with Nick, because he knows me well enough that usually he knows what I am trying to say- even if I don't have the perfect words! I love having our private language while back home. So useful! You motivate me to keep learning Slovenian, I hope that I will be able to at least talk in the next year. And I agree with you, I would rather work a mediocre job in an awesome city close to my family! My reading is better than my speaking, thats for sure. I've slowly learned that its best to just attempt speaking, and Nick will always help correct me or answer any questions. I'm sure you can take the same approach too- the guys can usually help to read our minds, even if the words coming out aren't perfect! My sister and brother-in-law do the language thing all the time! My BIL is from Haiti so they both speak fluent Creole...they use it all the time when they don't want other people to know what they're saying! Then they know exactly what I'm talking about! Its so useful to be able to do that- just have your own private form of communication. Exactly my thoughts! The choices are so hard. It's all about balance!